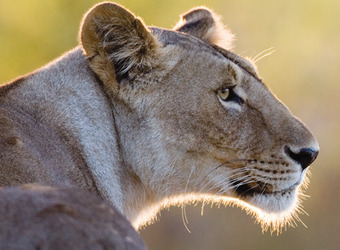 A diverse range of activities and experiences are available in Queen Elizabeth National Park's 764 square miles of forest, grassland, swamp and lakeshore. The snow-capped Ruwenzori Mountains tower to heights of nearly 17,000 feet in the distance. 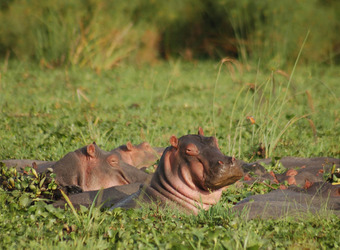 Beyond traditional wildlife drives and bush walks, other activities available include boat cruises on the hippo-filled Kazinga Channel, forest walks in Maramagambo with its famous bat caves, brilliant bird watching (with the possibility to see about 60 percent of Uganda's endemic species), and intriguing cultural visits to local communities. Enjoy kayak trips on the park's largest crater lake, Lake Nyamusingire. More intrepid travelers may enjoy challenging hikes into Kyambura Gorge likely to reveal a number of primate species, including chimpanzees. With such a diversity of habitats, it’s not surprising that Queen Elizabeth Park is home to a wide range of animals. Visitors may see up to 95 mammal species, including some unique antelope varieties, and more than 600 species of birds. Among the park’s prolific wildlife are plenty of lion, leopard, hyena, elephant, buffalo and large concentrations of hippo in the Kazinga Channel. The rare sitatunga is found here, as well as topi, bushbuck and kob antelope. 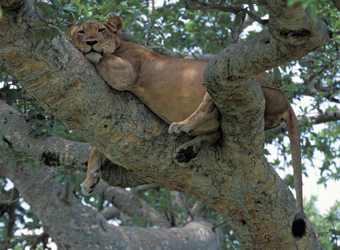 The Ishasha area in the southern sector of the park is famed for its tree-climbing lions; the males typically showcase beautiful black manes. Down into the Kyambura Gorge, hardy hikers will find chimpanzees, red-tailed and vervet monkeys, black and white colobus monkeys and baboons. And on Lake Edward, lucky guests may see the rare shoebill stork. 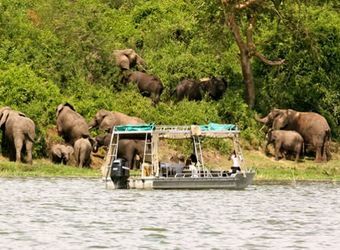 Beginning in Kampala, Uganda's famous parks form an informal circuit that commences with Murchison Falls in the far north along the Victoria Nile. Its location is unique, as it is bisected by 71 miles of the Victoria Nile River. Kibale Forest is a natural next stop to view chimpanzees, followed by Queen Elizabeth National Park for its unique lion behavior and birdlife. Perhaps the peak highlight of Uganda is Bwindi Impenetrable National Park farther south, one of the only natural habitats of the critically endangered mountain gorilla. For further gorilla viewing in a similar yet different ecosystem, traveling beyond Bwindi into Volcanoes National Park in Rwanda is an option. When did you visit Queen Elizabeth Nat'l Park?